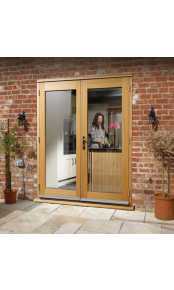 External French doors are becoming increasingly popular. With their stylish and contemporary look these doors provide an elegant addition to any home. Our French doors are available in a selection of fully finished white painted, oak and hardwood species. By clicking on the door set you will find further information including a full description and technical specification as well as the accurate external frame to frame measurements. We are also able to manufacture made to measure timber French doors to your exact requirements, therefore, if our standard range of doors does not fit your external aperture or you would like some further advice please contact our sales team on 020 3150 3103.